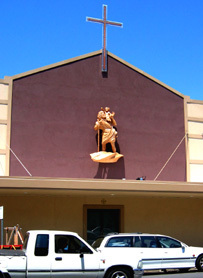 'Christ and St Christopher' was commissioned by St Christophers Catholic Church to decorate the facade of the renovated, art deco cinema that is their church building. 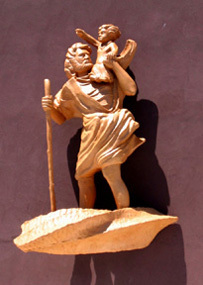 Here, St Christopher is seen bearing a baby Christ through a storm tossed river. To create this work I started by welding together a stainless steel armature. Expanded foam was then built up around the armature. This foam was carved into the forms of the sculpture and covered with a mesh to hold the render in place. When the render was applied, and while still soft, it was carved to refine the details of the finished sculpture. Within the framework of the armatures for the figures and the 'water', I created brackets that would later engage with the bolts that were placed in the wall during the reconstruction work. The brackets and bolts were designed with my engineer and I worked with the client's builder to establish these custom fixing bolts in the masonry wall. When the scaffold was removed, we craned the sculpture up to the bolts where it 'clipped' into place.